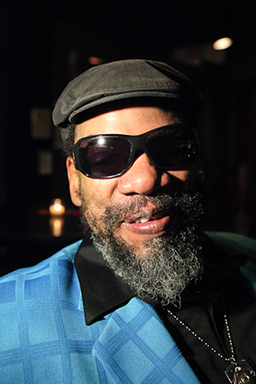 I’ve known Henry Butler since 1980, when I first reviewed him for the New Orleans weekly Figaro. (Later I became his piano student, and still later his friend). Henry has been known since the 1970s as New Orleans’ homegrown piano monster, drawing on a limitless technique, not only deeply rooted in the New Orleans R&B tradition of Professor Longhair and James Booker and Dr. John, but extending that tradition into technical realms and rhythmic originality far beyond the originals. Butler appeared on the scene in New Orleans around 1978. I’ve always felt that Butler, blind since infancy, has never gotten his due on the national jazz scene, although he’s played in major venues, was featured on the late Billy Taylor’s Jazz Alive program on New Year’s Eve around 25 years ago, and has made many recordings. Listening to him can be a transformative experience, certainly a psychically cleansing one. What comes across immediately is his power. His touch is strong, even lapidary, full of conviction; one never gets the impression that he is assaulting the piano. His most powerful pieces, including originals “Dr. James” (for James Booker) and “Orleans Inspiration,” which he played last night, are carefully constructed multi-part compositions, analogous in form (but not in sound or anything else) to Sousa marches, ragtime and early jazz. This form is a multi-part structure whose thematic sequence is ABAC, or AABBACCDD, where there are at least three major themes, and often four, in contrast to standard song form of AABA. Butler knows how to set a complex rhythmic motif going and make us wait for the next “event.” His improvised or free-form section is often comparatively brief, consisting of his trademark high-register feverish filigree sound textures over either his blockbuster left hand octave syncopations, or, more dramatically, a tenor melodic line in the left hand with nothing in the bass, creating a feeling of suspension, and serving the same purpose as a break in the rhythm (Jelly Roll Morton famously said that every tune must have a break). It all serves to keep his listeners on the edge of their seats. Butler tells stories: of struggles, perhaps personal, perhaps collective; of determination, of triumph, of tribute to his great predecessors—all of whom he towers over in technique. Opening the set with Lead Belly’s “Rock Island Line” and proceeding to two Jelly Roll Morton pieces, “Buddy Bolden’s Blues” and “Wolverine,” he spoke of when he heard Morton, being deliberately vague at first about whether he heard him live or not, thus embedding himself a little deeper in jazz history than actual chronology would have permitted—Morton died in 1941 and Butler was born in 1949. But he couldn’t keep the pretense going too long and did say that it was through recordings he had heard Morton. Of course, he did hear and know James Booker, 1939-1983, as did I and every other music fan living in New Orleans during his lifetime, all of whom were shocked at his early death. By opening with historical pieces, including a rich improvisation on Scott Joplin’s eternal “The Entertainer,” Butler not only paid tribute to his musical traditions, but he introduced the multi-part structure in examples of its origins, which he then made his own through his signature maximalist style. Next he played his two tribute pieces to James Booker. The first, “L’Esprit de James,” incorporated Booker’s signature left-hand pattern consisting of two bass notes followed by two chords in shuffle (dotted) rhythm, a relaxing but compelling rhythmic vehicle. The second, “Dr. James,” is one of Butler’s masterpieces. The rhythmic vamp alone is a compositional triumph, using left-hand octaves that jump between two bass registers, and right-hand chords that push each measure into a savory minor-over-major (#9) dissonance. This repeated vamp serves a melodic function—it’s rich enough to do so—and after four iterations is followed by a brief two-measure harmonic excursion into a neighboring key, and then back to the original home key for a classic Professor Longhair blues figure in the right hand that brings everything back to a down-home familiarity. And that’s the A section. This is followed by an improvised section in a single-chord setting that freezes harmonic movement, while Butler displays his right-hand pyrotechniques in the upper registers of the instrument. The tension builds and builds, until we finally return to the A section, with its rich embedded harmonies and seductive chord changes, releasing the tension, and ending in the thoroughly familiar Longhair figure, and without winding down at all, terminating with two rhythmic chords, leaving the listener entirely satisfied, though suspended in mid-air. Butler’s only standard followed, Ellington’s immortal “In My Solitude,” in which he plays a few sly harmonic tricks, like switching keys by a half-step from the introduction to the main melody. It was his prepared joke. He carried off the tune gently and with warmth, using rich chords, left-hand stride, and his signature upper-register filigree in the improvised section, and another modulation at almost the very end. There was little lyricism, however, in a tune that clearly invites it. Butler, it seems, has little interest in that matter. By lyricism, I’m referring to improvised melodic lines, usually in right-hand eighth-notes, that typically express tenderness, pain, regret, hipness, fascination, etc. As an improvisational device lyricism really only entered the piano repertoire of effects with Earl Hines in the late 1920s. When people said he played the piano like a horn, this is what they were referring to (Hines frequently did it in octaves to be heard above the drums in those pre-amplification days), since the horns—the trumpets and clarinets of the time, and later the saxophone and other single-line instruments—provided the lyrical component of the ensembles. Eventually bebop came to stress the single line above all, and its pianists excelled in this area. Still there were a few hold-outs, like the late Dave Brubeck, who, though he wrote exquisite lyrical melodies, did not stress this aspect in his improvisation. These are conscious choices on the part of consummate artists. I certainly don’t mean to imply that Buter is—or Brubeck was, for that matter—incapable of lyricism; merely that he chooses to draw on other devices to say what he has to say. The excitement of Butler’s music derives from his bold and muscular use of the entire keyboard, his inventive syncopations, his rapid dialogues between keyboard registers, his mastery of form and repetition: in a word, his drama. He does not evoke dreaminess, love, or delicate grace, as one abundantly finds in the music of Bill Evans and his school, Keith Jarrett, Herbie Hancock, or any number of jazz piano masters. And the drama of Butler’s performance takes us to the depths, to the cauldron of our personal power and capacity to triumph over adversity. He transforms the assertion of this power into something sublime and accessible to his listeners, an accomplishment unique in this tradition. Incidentally, Beethoven (whose fabulous improvisations are lost) also drew on structure more than lyricism for his power. The climax of the set came in Butler’s next piece, his ingenious “Orleans Inspiration,” composed in 1978, so the oldest of the originals he played last night. The piece sweeps the listener up in all-encompassing sound and drives you headlong through its several parts, each one an ingenious and complex rhythmic setting, like a strenuous acrobatic dance on the keyboard. Its introduction consists of a vigorous alternating chord pattern in the tenor range with no bass, that has the listener floating, suspended in the upper registers then the key shifts unexpectedly to open the A section, plunging into a new rhythmic motif, now from the deep bass, with a powerful chordal melodic motif in the right hand. After two iterations, a B section jumps to the sub-dominant and comes home through a satisfying succession of resolutions culminating in a bass octave walk-up to what we expect will be a repetition of the A section, but instead he switches to an improvisational interlude consisting of a left-hand chord-alternating syncopated tenor-range obbligato, over which he improvises his filigree sound textures. These are the four rhythmic-harmonic elements that constitute this piece. By alternating between the more floating tenor-range gestures in the introduction and interlude and the deep-bass-rooted ones in the A and B sections; by the variations in rhythmic structure in each section; by the harmonic relationships that also alternate, but between surprising modulation and satisfying resolution, Butler has created a vehicle that keeps drawing the listener in as he makes our bodies want to move. The piece is completely within the spirit of the New Orleans piano tradition, but again, its technical demands and harmonic surprises place it outside the performance range of Butler’s better-known predecessors. No one I know plays Butler’s originals nor do they play tributes to him. Fortunately, he’s made many recordings and plays publicly with some regularity. Butler closed the set with three crowd-pleasers, a gospel tune, “Bye and Bye,” and two vocals, “Hello, Josephine” and Longhair’s “Go to the Mardi Gras.” He has a powerful baritone with an extended range that fits well with his muscular style, and his strong vocals provide a balance to his playing. However, they will never bring him to the heights of popularity that Dr. John or Allan Toussaint have achieved—they recently performed at New York’s Town Hall to a full house. Butler is not a pop singer; he is not convincing as a romantic vocalist. He is a consummate musician who has chosen to embed himself in the New Orleans piano tradition, and to extend the technical and purely musical range of that tradition far beyond the capacities of anyone else in that tradition, living or dead. This is why he is unique, a treasure, and why, along with almost every other serious artist, will probably never become a household name. Joel Simpson is a Brooklyn-based freelance photographer, musician, and writer. He lived in New Orleans for 27 years and studied piano with Ellis Marsalis and Henry Butler.